Pavel became Rich Morning’s assistant after a grueling seven-month audition process, in which he distinguished himself from the competition by juggling squirrels and singing acapella. 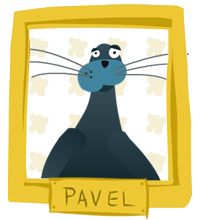 Pavel is not only Rich’s assistant but his best friend, accompanying him to fancy Hollywood clubs and occasionally cleaning his swimming pool. Pavel is currently writing a tell-all biography about his experience working on the Rich Morning Show, and is reportedly dating Dolores, a large gorilla who won’t take ‘no’ for an answer.